On April 1, the Canadian High Commission in London paid tribute to Norman McLaren, one of the world’s great animators, who died earlier this year, writes Brian Sibley. There was nothing surprising in this, since McLaren’s innovative work for the National Film Board of Canada not only received international acclaim, it achieved a far- reaching influence on the art of animation. What did surprise me, somewhat, was the choice of wording on the invitation: ‘An Evening with Norman McLaren’. That, however, was what it turned out to be, with many of McLaren’s friends and colleagues gathering to remember a gentle man with an extraordinary genius for communication through movement, sound and colour. There was also a selection of some of McLaren’s finest film work, including: Boogie Doodle, Hen Hap, Begone Dull Care, The Blackbird, Pas de Deux and the 1952 Oscar-winning Neighbours. 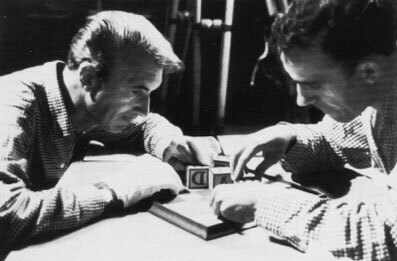 Norman McLaren with Grant Munro. It was most appropriate, therefore, that the evening’s special guest was Grant Munro, the animator and filmmaker who also played one of the two hostile neighbours in McLaren’s simple but powerful allegory on war. Munro had first met McLaren in 1944, when an interview was arranged for him by a college tutor. McLaren offered Grant Munro a job with the Film Board as a title artist. At first Munro was reluctant to accept what he assumed would be boring, repetitive work. He told McLaren he could do lettering, but he didn’t want to make it his career. McLaren could have been forgiven for having terminated the interview, but instead he attempted to fire the young Munro with enthusiasm, suggesting he might care to animate titles in clay or pipe-cleaners or sand… ‘Or salt?’ asked Monro. ‘Or salt!’ replied McLaren. A synthetic sound track - there are two notes side-by-side. The note nearer the sprockets is higher. So Munro joined the NFBC and the second film for which he designed the titles was entitled Salt from the Earth, the letters of which he carved from a block of rock salt. How appropriate then that they had called it ‘An Evening with Norman McLaren’.